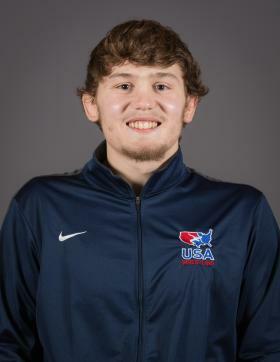 Marquette, Mich.—The Northern Michigan University Olympic Training Site won a silver and bronze medal in the final day of Greco-Roman competition at the Dave Schultz Memorial in Colorado Springs, Colo.
Finishing in second-place at 82 kg was Carter Nielsen. In the first-place match, Nielsen faced 2018 World Team member Kamal Bey of the Sunkist Kids. Nielsen would score the first two points of the match and enter the second period tied at two, but he ultimately fell 4-6. Jesse Porter faced Brandon Mueller of the U.S. Air Force in the 77 kg bronze-medal match. After ending the first period down 0-1, Porter came back in the second to earn a 7-1 victory and a bronze medal. Ending the competition in fourth place were Spencer Woods at 82 kg and Khymba Johnson at 97 kg. Woods fell to Vlad Dombskiy of the Army WCAP program and Johnson fell to Eric Twohey of the Minnesota Storm 4-6. In total for the two-day event, the NMU-OTS team earned seven medals and had two fourth-place finishes.